I offer supervision to counsellors and therapists working both for organisations and privately, across various modalities and endeavour to honour and respect the modalities of my supervisees. I have a Diploma in Counselling Supervision, and offer both individual and group supervision. I am enthusiastic regarding the use of creative approaches if you would find this useful. we enter… a liminal space, a place of contemplation and of inquiry as a prelude to taking away a fresh perspective that can lead to new kinds of action. My own modality is Humanistic, incorporating elements of the Person-Centred Approach, Gestalt Therapy and Transactional Analysis (TA); however, I have enjoyed working with supervisees with Integrative, Psycho-dynamic, Systemic and even Jungian modalities. I am a member of both the BACP and the UKAHPP. I would like to think that my style in the supervisory relationship reflects some of Carl Rogers’ tenets including prizing, warmth and acceptance.  I am able to work with a variety of supervision models, most frequently using Hawkins’ ‘Seven-Eyed Model of Supervision’; however, I am prepared to work to other models including for example Carroll’s ‘Six lenses of reflective supervision’ which is quite detailed and even the newer Hewson and Carroll’s ‘Reflective Practice in Supervision’ model. We can draw on various other models and tools for example those offered by Inskipp & Proctor, Patrick Casement as well as the ever popular Mike Carroll. Many supervisees find working with Kagan’s ‘Interpersonal Process Recall’ (IPR) very illuminating to facilitate creative inquiry. Clearly professional and ethical considerations are key to supervision and although I primarily refer to the BACP ‘Ethical Framework’, I am happy to work to individual requirements for other professional bodies and to codes of practice as required by specific organisations. In helping supervisees address various Ethical dilemma, I would typically suggest we refer to Bond’s ‘Ethical Problem-solving model’, as I find it valuable in consideration of ethical principles and guidelines. When considering supervisee development I find the Stoltenberg, McNeill & Delworth ‘Integrated Developmental Model’ (IDM)useful. I have a template Supervisory contract which of course we can tailor to our needs, it typically helps us to outline and clarify our responsibilities in support and reinforcement of the working relationship. So if you are interested in discussing supervision, do give me a call, I’m sure we can create a fun and rewarding space. Mearnes’ (1991) describes supervision as needing to be ‘safe enough, … to express deepest fears and doubts’, in support of making ethical choices. We can book a meeting now! Copyright © Jonathan Mitchell 2015.